What makes a red velvet cake red? Well, originally, "red" was not meant to describe the color of the cake, but in fact described the volatile results when baking soda & buttermilk (acid & alkaline) chemically react. But apparently, sometime in the mid 1960s, someone somewhere decided that an old-fashioned red cake was not "red" enough, and added red food coloring to the cake batter. So there. Now you know! 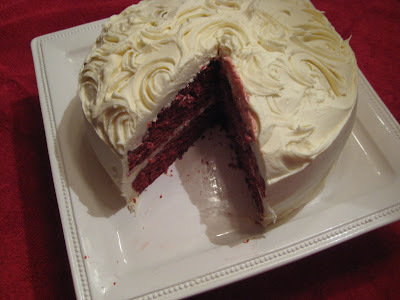 The first time I ever made a red velvet cake was when my friends, Jason and Jimmy, got married. Just like in the movie Steel Magnolias, Jason wanted a red velvet cake in the shape of an armadillo. Luckily I had my brother Denny to help me with it. I think it turned out pretty good! This is also my fabulous friend, JKB's favorite cake and I'm always happy to make it for her. Grease and flour two 9-inch round cake pans. Set aside. Cream shortening and sugar. Add eggs and vanilla; beat well. Sift flour, salt & cocoa together. Add alternately with buttermilk. Beat after each addition. Stir in baking soda and vinegar mixture, then blend in the food coloring. Bake for 30 minutes, or until the cakes bounce back when lightly tapped. When completely cooled, frost with Cream Cheese Frosting. Yes, this seems like a huge amount of red food coloring to add to a cake, but just go with me on this one. You don't want it to look like just any basic chocolate cake, which is basically what it is. It's customary to frost this cake with the cream cheese frosting, but any favorite frosting will go just as nicely.